In June 1992, Rio de Janeiro hosted the famous United Nations Conference on Environment and Development, which proclaimed that environmental protection should be an integral part of the development process, and gave rise to a multitude of international and national environmental initiatives. One of the consequences of the 1992 conference and a general rise in interest in environmental issues was the development of voluntary forest certification. In 1993, the FSC (Forest Stewardship Council) system appeared, which, according to the original plan, was to solve two main tasks: first, to allow representatives of different parties (ecological, economic, social) to agree on the principles and criteria for proper forest management, and second, to highlight from the general mass of forest companies and producers of forest products those who meet these principles and criteria. Twenty years ago, when the development of the FSC system was just beginning, many environmental organizations placed great hopes on it. At that time, it seemed obvious that in the course of time the residents of economically developed countries would take an ever more responsible attitude to their purchases, and increasingly strive to buy products produced as a result of environmentally appropriate, socially beneficial, and economically viable forest management - in fact, so it turned out. It was assumed that the FSC system will allow responsible buyers to understand what products are produced as a result of proper forest management, and thus provide their producers with serious market advantages. 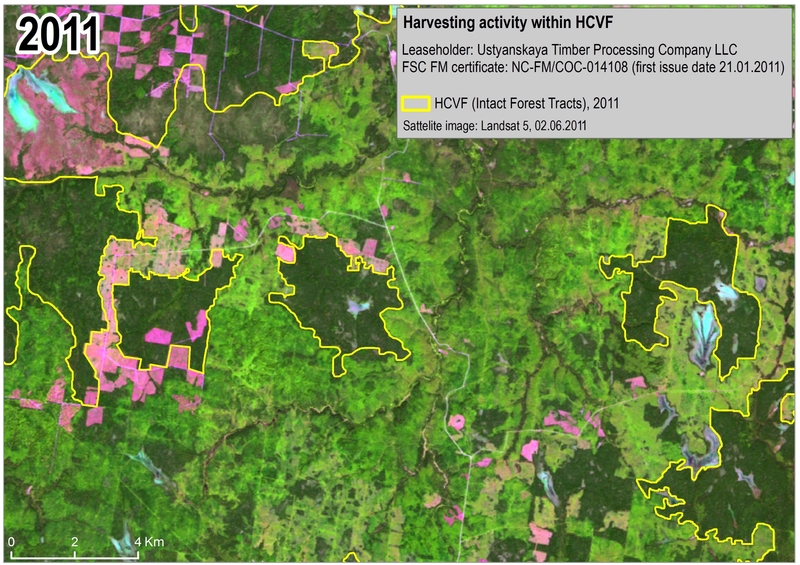 The main hope was that these market advantages would be a powerful incentive to improve the quality of forest management, preserve high conservation value forests, and ensure the sustainability of forest use. In Russia, one of the main centers for the development of the FSC system was Arkhangelsk region - the first certificate in this region was issued in 2000, and already in the second half of the zeroes, the majority of large and medium-sized forest users in the region directly or indirectly involved. The FSC system made it possible to smooth out or even stop many environmental conflicts of the late nineties and the beginning of the zeroes, and provided the products of the Arkhangelsk forestry sector with a worthy place in the most environmentally sensitive markets in Europe. Now it is perceived as a product of "environmentally appropriate, socially beneficial, and economically viable" forest management. 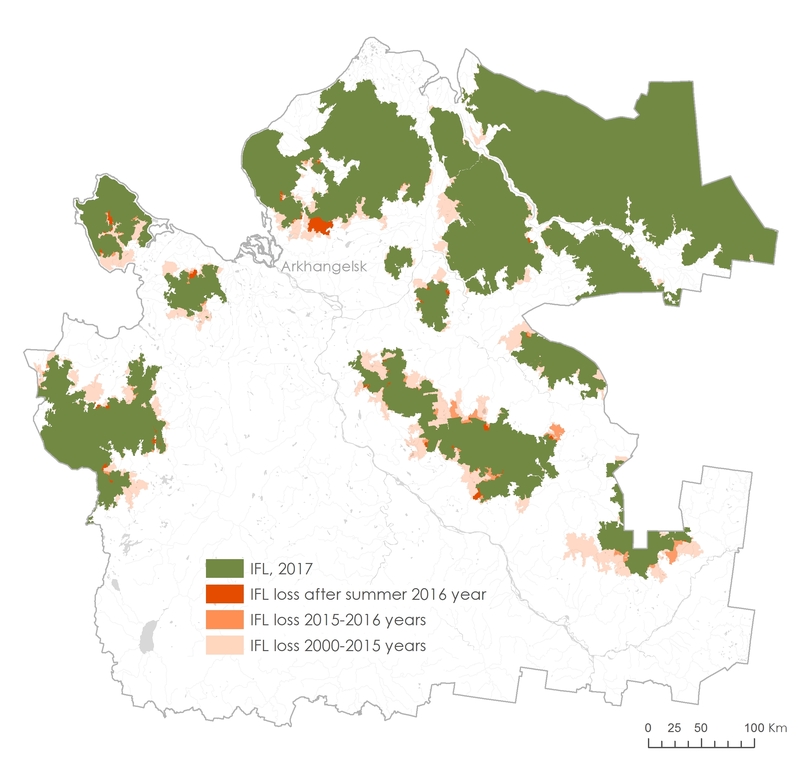 That's only the forest management system in the region has not changed much - its essence is still extensive forest mismanagement, leading eventually to the decline of taiga, desolation and death of forest villages. In September 2016 the Sixth World Conservation Congress with participation of representatives of 170 states adopted a special decision concerning protection of primary forests, including intact forest landscapes (IFLs) – the Motion 048. It states that the Congress encourages states, the private sector and international financial institutions to avoid loss and degradation of primary forests including IFLs, to promote their conservation, to increase efforts to establish large and connected protected areas, engage and support indigenous peoples and local communities in their efforts to conserve primary forests, including intact forest landscapes. In September 2014 the General Assembly of the FSC adopted the so-cold “Initiative 65" (Motion 65), providing protection of the intact forest landscapes. 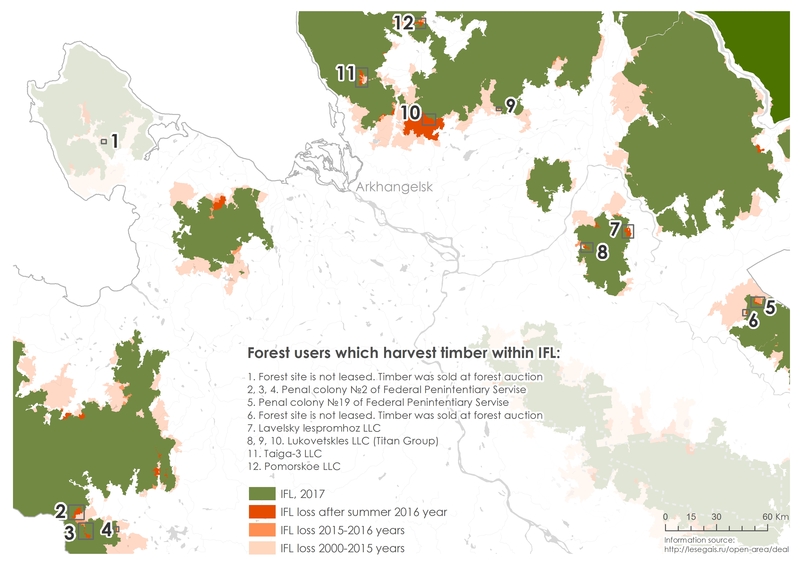 This decision demand the development of the new editions of national FSC standards aimed at protection of IFLs, or, if the relevant standards fail to be put into effect before the end of 2016, managing for intactness not less than 80% of the total IFI area within the boundaries of each forest management unit. Arkhangelsk oblast is one of the Russian regions where both decisions are particularly relevant. Here are located large and highly significant in European-scale IFLs including those unique for their terrestrial ecosystems (primarily the plain middle and northern taiga). The most developed system of FSC voluntary forest certification exists also here. Arkhangelsk Oblast is the most important historical center for the development of this certification in Russia. As soon as the year passed since one of the aforementioned decisions, and three years after another, it is necessary to sum up the first results. Among 12 IFLs of Arkhangelsk Oblast only in two during the existence of FSC system have been made decisions that recently correspond to Motion 48 and Motion 65, in three during the last year the destructive activity has not been detected, and in seven - there are ongoing logging operations destroying IFLs. Wood from them is consumed by FSC-certified enterprises. Besides this certified enterprises could be involved in the destruction of particularly valuable primary forests that are not IFLs. The average losses of IFLs in Arkhangelsk Oblast are about 1,2% per year with the bulk of these losses occurring in central and western regions with productive forests and a high level of biological diversity. Average losses of IFLs in the central part of Dvina-Pinega interfluve area (Dvinsky forest) exceed 2% per year. In general this IFL lost 27% of its area during the period from 2000 till 2017. In the near future the losses of IFLs in Arkhangelsk oblast can significantly increase. In the summer of 2017, two projects were included in the federal list of priority investment projects for forest development. They foresee the construction of very large new sawmills of the Pomor Timber and Lesozavod 25 in Arkhangelsk. If both enterprises will be built, they will need huge additional volumes of coniferous logs, whose reserves in the forests of the region are already extremely depleted. To provide new enterprises with raw materials, the regional authorities will be forced to give out very large areas of high conservation value forests (including IFLs) for cutting. Since 2000 Arkhangelsk oblast is the most important center for the development of FSC voluntary forest certification in Russia. Now almost all large and medium-sized enterprises in the region are involved in FSC – either through forest management certification or through the system of FSC-controlled wood. This situation, when FSC directly or indirectly covers almost the entire forest sector, exists in Arkhangelsk Oblast for the past decade. Formally the FSC system requires protection of the high conservation valuable forests including IFLs (principle 9, Motion 65, Russian National standard of forest management according to the FSC scheme etc). 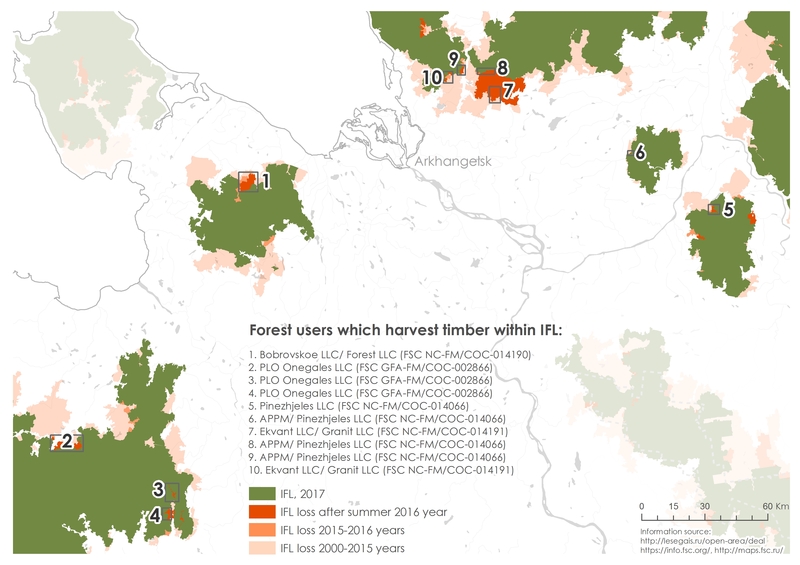 However, in practice the wide distribution of FSC system in Arkhangelsk oblast did not lead to a reduction of annual losses of the IFLs. In 2016 another system, PEFC, began to develop in the Arkhangelsk Oblast. While it did not have a significant impact on forest management practices. The absolute majority of IFL losses in the Arkhangelsk Oblast are related to the activities of the certified companies. Only 3,5% of IFL losses are not obviously and directly related to the activities of certified companies. There are only two intact forest landscapes, where such decisions were made during the time of forest certification development in Arkhangelsk Oblast. They are IFLs on Onega peninsula (where “Onezhskoye Pomorye” National Park was created by the Decree of the Government of Russian Federation № 153 dated February 26, 2013) and in the upper reaches of Vashka River on the border with Komi Republic (where Uftiugo-Ileshsky Zakaznik (wildlife sanctuary) was created by the Decree Of Arkhangelsk Oblast Government № 475-pp dated November 24, 2015). - provide clear, substantial, additional, long-term conservation and social benefits according to Motion 65. 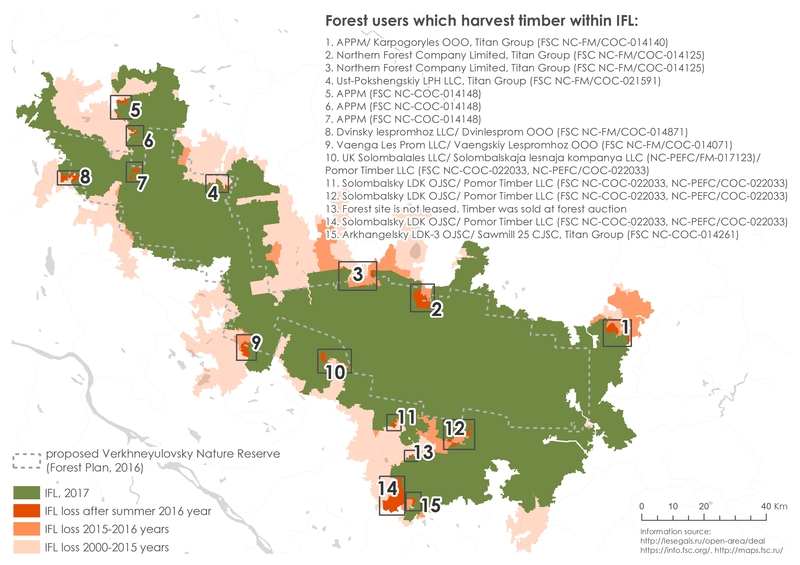 Forest use in these IFLs still needs improvement. 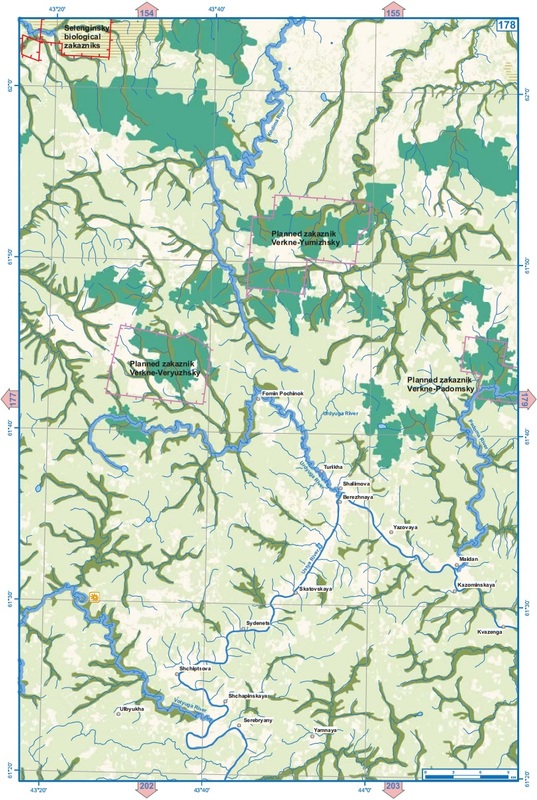 In particular it is necessary to organize the protection zone for “Onezhskoye Pomorye” National Park, to establish woodland key habitats in the places of concentration of rare species to the south from Uftiugo-Ileshsky Zakaznik, to ensure proper forestry in developed forests and achieve inexhaustibility of coniferous forests use. However, in general, forest management on these territories can be considered acceptable from the point of view of conservation of intact forest areas and in compliance with the Motion 48 of the Sixth World Conservation Congress and Motion 65 of the FSC General Assembly in 2014. Urgent action by FSC in these IFLs is not required. IFLs in the central part of Dvina-Pinega interfluve area (Dvinsky forest) represent the largest in Europe section of the wild plain middle taiga (and partially northern taiga). To preserve its most valuable part the Forest Plan and Territorial Planning Scheme of Arkhangelsk Oblast foresee the creation of “Verkhnejulovsky” Zakaznik with an area of 489 thousand hectares. The optimal term for its creation was 2017 announced as “Year of Ecology” and “Year of Protected Areas” by the decrees of the President of the Russian Federation. However, due to the disagreement of the largest forest users, zakaznik with concrete boundaries will not be created in 2017 – neither on the originally planned area nor on the minimum acceptable area from the environmental point of view (300-350 thousand hectares, which makes 26-30% of the IFL area in 2000). The reason for the fierce resistance of companies – forest users to creation of zakaznik at a planned or even reduced in 1.4 – 1.6 times area is a catastrophic depletion of adjacent forests, including the results of the activities of certified companies. Greenpeace stated and proved in 2014 that FSC-certified companies use the coniferous forests of Dvina-Pinega interfluve area in an absolutely exhausting manner. Secondly, the “moratorium zones” that were allocated earlier can’t be transformed into protected area without large losses. It means that the most common FSC mechanism of “IFLs protection” (moratorium) is not such in fact, but actually just determines the order of accesing and cutting of different parts of IFL. 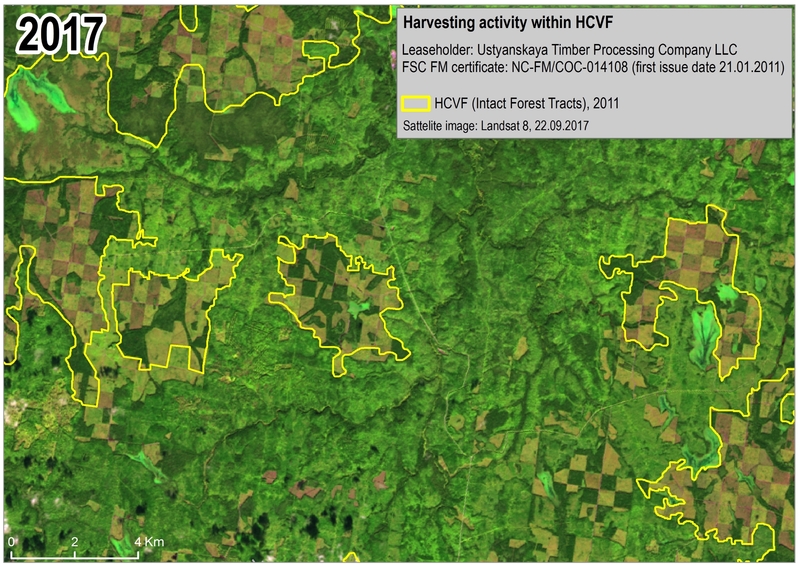 Uncertified enterprises – forest users in the Dvina-Pinega interfluve area either are parts of the large holdings which provide their FSC-certified processing enterprises with wood, or they supply at least part of their products inside the framework of the FSC-controlled wood system. Products produced from all this wood are delivered to consumers as certified ones (either FSC or FSC mix), which can be mistaken by them as the resulting from “environmentally appropriate, socially beneficial and economically viable” forest management. Thus, the FSC is the key that opens up the environmentally sensitive markets for the timber that has been harvested as a result of exhaustive forest use in IFLs and for the products produced from it. Therefore the FSC is one of the driving forces of IFLs destruction. - Rapid depletion of coniferous forests, forcing forest users to develop new areas of intact forest landscapes. Many of the largest forestry enterprises in the Arkhangelsk Oblast and neighboring regions purchase raw materials for processing in the framework of the system of so-cold "FSC-controlled wood". Currently the system is in a transitional phase: the new standard of FSC-STD-40-005 V3-1 Requirements for Sourcing FSC Controlled Wood came into force on July 1, 2016 and must be fully implemented from January 1, 2018. According to this standard, material (wood) shall not originate from commercial logging in Intact Forest Landscapes9 (IFLs), and shall not originate from areas where management activities contribute to/increase the fragmentation of IFLs. Besides the 9 FSC principle states that "the Organization shall maintain and/or enhance the High Conservation Values in the Management Unit through applying the precautionary approach". Motion 65 and many other FSC documents unequivocally state that IFLs in the understanding of FSC are parts of HCVFs. The previous edition of the standard for controlled wood - FSC-STD-30-010 V2-0 and FSC-STD-40-005 V2-1 – required that FSC-controlled wood does not purchase wood harvesting in forests where the high conservation values are threatened by forest use. 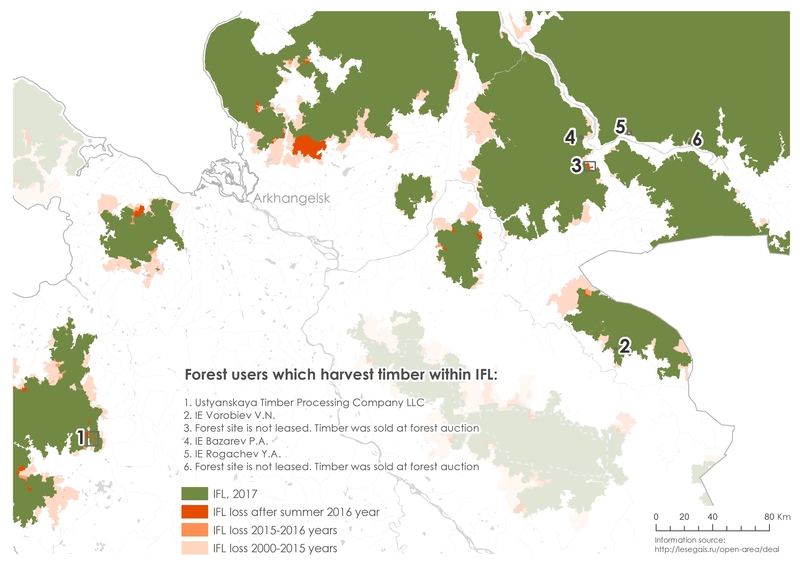 Despite this, in Arkhangelsk oblast there are widespread cases when timber obtained with destructive for IFLs logging is purchased in the framework of FSC-controlled wood directly or through chains of uncertified intermediaries. Such cases are associated with 36,6% of IFLs losses in Arkhangelsk Oblast during the period of 2016-2017. Thirdly, the new FSC-STD-40-005 V3-1 standard, which was to be gradually implemented in the period from July 1, 2016 to December 31, 2017 also doesn’t work. 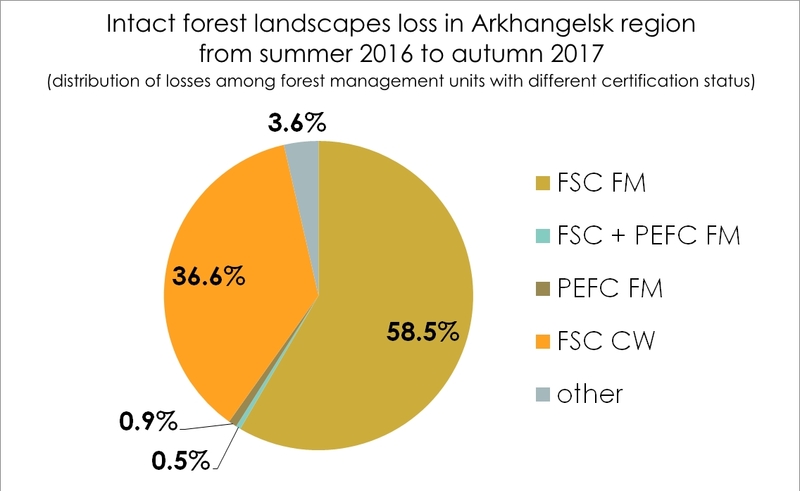 The losses, which are not associated with the forest certification, account for only 3,6% of the total loss of the area of intact forest landscapes in the Arkhangelsk Oblast during the reviewing period. Part of these losses is definitely not related to the activities of the FSC or PEFC certified companies. Cuttings are done for local needs and local market where the voluntary forest certification doesn’t play any role. Another part of these losses may be related to the activities of the certified companies, but the available data do not allow fixing such a connection. All disputed and unclear cases, in which the connection between activities of certified enterprises and IFLs losses could not be unambiguously and undeniably established, are included in this section. The main summary source of information on high conservation valuable forests in the regions of North-West Russia is the published in 2011 book named "Mapping High Conservation Value Areas in the Russian North-West. Gap-analysis of the Protected Areas Network in Murmansk, Leningrad, Arkhangelsk, Vologda regions, Republic of Karelia, and the city of Saint-Petersburg". The book was prepared by the group of leading Russian experts on the territorial nature protection with participation of experts from Finland and reflects the situation for the period of 2010-2011. 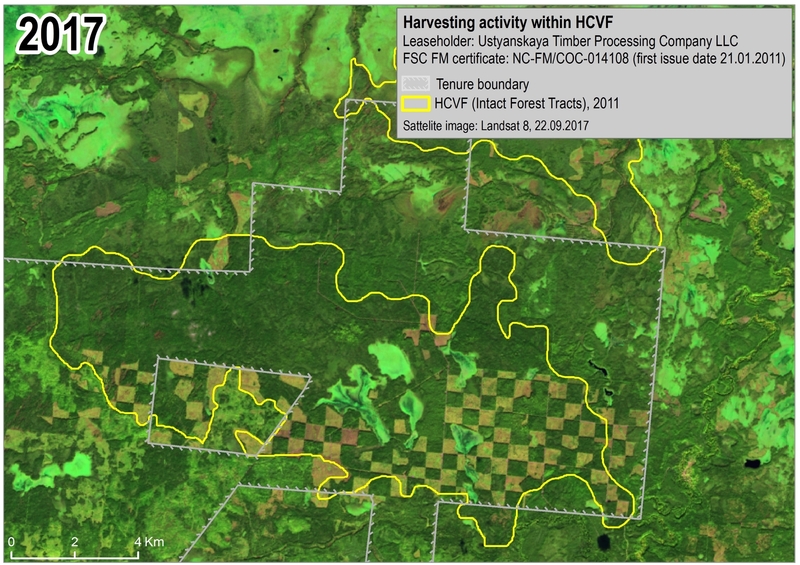 The most valuable category of the primary forests that are not included in the composition of the intact forest landscapes is the Intact forest tracts with the lower than IFLs area but met sometimes in those districts where there are no IFLs, including the most productive forests with the very high level of biological diversity. Formally the FSC system of voluntary forest certification requires the preservation of these forests too (as well as all forests with high conservation value). This is what FSC principle 9 says in its current version: "the Organization shall maintain and/or enhance the High Conservation Values in the Management Unit through applying the precautionary approach”. The complete analysis of losses of the Intact forest tracts and other forests with high conservation value, as soon as connection of these losses with the activities of certified enterprises, has not yet been carried out. However the situation with individual tracts, located in the southern part of the Arkhangelsk Oblast, shows that these high conservation valuable forests are being destroyed at a tremendous speed, including through the activities of the FSC-certified enterprises. 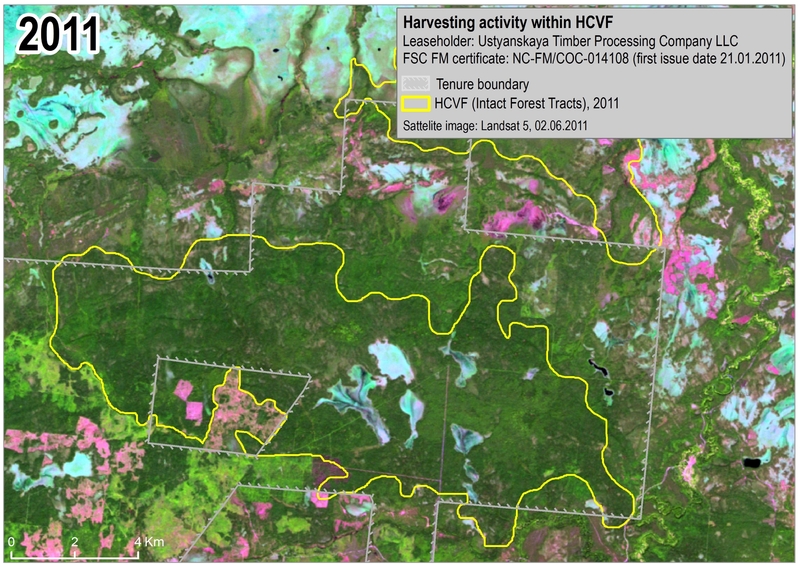 The examples below show that FSC system not only does not guarantee the preservation of the high conservation valuable forests but also admits the destruction of concrete massifs of these forests during the very short time period which could be compared with the validity of one certificate. Standards related to sourcing FSC Controlled Wood. That means that, in practice, the FSC system in a part of protection of high conservation value forests and development of environmentally responsible forest management does not work. In fact, the FSC role in the Arkhangelsk oblast does not correspond to the stated FSC mission. This review does not analyze the social and economic aspects of forest certification under the FSC system. However, the lack of good forestry (that could give the local population the numerous and permanent jobs), cases of bankruptcy and the cessation of the activities of previously certified enterprises suggest that the social benefits and economic viability of the FSC-certified enterprises are also not all right. All this suggests that in the Arkhangelsk Oblast there is an extremely bad situation with the FSC voluntary forest certification. Instead of promoting the environmentally responsible, socially beneficial, and economically viable forest management FSC in fact supports the traditional extensive (without good forestry) model of forest use that leads to the destruction of high conservation valuable forests. To improve the situation and to preserve the remaining high conservation valuable forests as well as the FSC reputation, urgent and effective measures must be taken. First, it is necessary to create the authoritative independent working group for the detailed examination of the roots of current situation and for the working out proposals for its correction (including clear measures for protection of IFLs and other HCVFs, development of good forestry in developed forests and sustainability of cut rates in coniferous forests). Second, measures are needed to save high conservation values of “Verkhneulovsky” planned zakaznik before making a final and irrevocable decision about its creation and about its final boundaries. 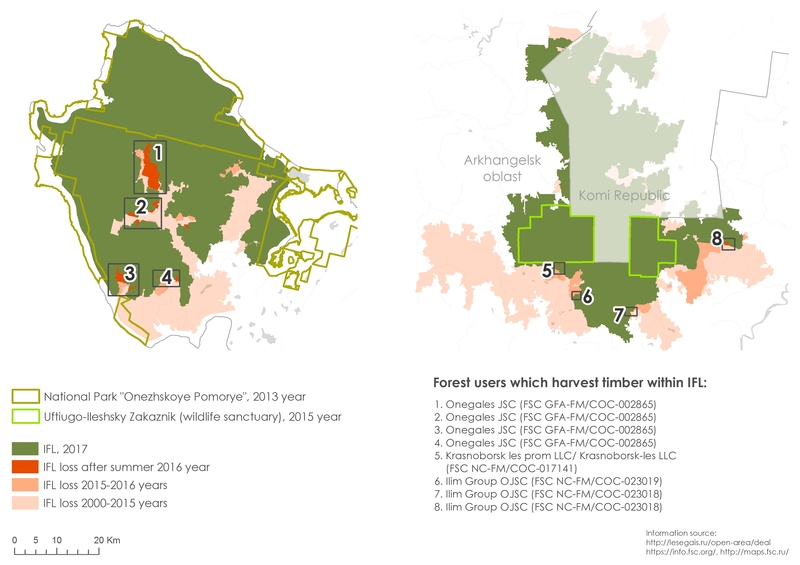 Before the creation of zakaznik the logging activity of FSC-certified companies inside its boundaries (according to the current version of the Forest Plan of the Arkhangelsk Oblast) has to be stopped or the certificates must be withdrawn. Third, it is necessary to ensure that the default indicator set by Motion 65 that implies management for intactness (full protection) of at least 80% of the IFL’s area falling within the boundaries of each forest management unit (except IFL on the Onega Peninsula and in the upper course of Vashka River where previous decisions about the creation of protected areas correspond to the Motion 65). Fourth, the certification bodies should consider all cases in this review when the activity of FSC-certified enterprises have led to the reduction or destruction of the IFLs or other HCVFs, and to take appropriate measures in accordance with the FSC standards and rules, up to the suspension or termination of certificates. Relevant appeals will be sent to the certification bodies.